Despite our efforts, on October 11, 2018, the California Public Utilities Commission (CPUC) issued an Order setting a dramatic increase in the on-going departing load charge levied on Community Choice customers. This Order has already resulted in the cancellation of at least one new Community Choice program. It poses an existential crisis to the success of virtually all of our programs. The Alliance isn’t going to accept this outcome. There is too much at stake. We are working on organizing a response. While this campaign is now concluded, and no more letters are being sent, we have preserved the original campaign information, below. The California Public Utilities Commission (CPUC) is scheduled on September 27 to consider a dramatic increase in the on-going departing load charge levied on Community Choice customers. This change threatens the viability of Community Choice programs in favor of the monopoly utilities and is therefore contrary to California Community Choice law. It is urgent to write legislators and CPUC commissioners to oppose this pending action. Please use our action network link (disabled) to send a letter opposing this action. The Power Charge Indifference Adjustment (PCIA) is an on-going fee imposed by the CPUC. It is levied by Investor-Owned Utilities (IOUs) on customers of Community Choice energy programs. The PCIA threatens to undermine the viability of Community Choice. The PCIA is a departing load charge: it passes on higher costs to Community Choice customers for renewable and brown power contracts IOUs incurred for customers who departed to Community Choice programs—energy that the IOUs can no longer sell to those customers at competitive market prices. According to statute, this monetary “loss” to the IOUs must be calculated as the difference between the actual costs of procurement minus the current market value of these stranded energy resources. Regrettably, the determination of the PCIA charge is anything but transparent. It relies on IOU information that is not public. As such, it is not known if IOU procurement costs are unavoidable or incurred fairly, how these were calculated, or how the market value of these “stranded” energy resources is established. Evidence presented in the California Public Utility Commission (CPUC) PCIA proceeding makes clear the IOUs often paid exorbitantly high amounts for solar and wind contracts in the years that these resources were contracted, much higher than the competitive market price at the time. Much of the PCIA cost burden is associated with these excessively high contract payments. As presently implemented, PCIA charges continue indefinitely. No matter how long ago a customer choice a Community Choice program, the IOU will continue to pass on departing load charges for electricity that the customer is not using. The impact of the PCIA is considerable. It already hits Community Choice programs with growing, unpredictable charges, undermining their competitiveness relative to the IOUs. These unpredictable charges also threaten the stability and financial viability of Community Choice programs. The CPUC’s PCIA implementation has consistently favored the IOUs, leading to a wave of calls to abolish the PCIA entirely. Or, if not, to at least reform it to ensure a level competitive playing field. In June 2017, the CPUC launched an examination of possible PCIA reforms. IOUs, Community Choice programs and advocates, and many other parties have participated; comment rounds, workshops, extensive financial modelling, have all been part of this proceeding. On August 1, 2018, Administrative Law Judge Roscow issued a “Proposed Decision” (PD). Shortly thereafter, on August 14, CPUC Commissioner Peterman issued a competing “Alternate Proposed Decision” (APD). The Alliance calls on the CPUC to comply with AB 117 and soundly reject the PD. The Alliance first released a position paper in opposition to the PCIA in March 2016, as a comment letter to CPUC commissioners, calling for the phasing out of the PCIA entirely. It seems that legislative action will be necessary to achieve that result. In the meantime, the Alliance is opposed to any implementation of the PCIA that is structured to disadvantage Community Choice programs vis a vis the IOUs. We also oppose PCIA charges that undermine the ability of Community Choice programs to deliver environmental, economic, and social justice benefits to the communities they serve. In particular, the Alliance calls on the CPUC commissioners to reject the APD as an explicit effort on behalf of the IOUs to undermine Community Choice programs. It increases PCIA charges by replacing the statutory valuation of “estimated” losses with a formula that includes only losses from the actual sale of stranded resources. This means there is an incentive for the IOUs to maximize losses by selling off stranded resources cheaply or not at all. It represents CPUC shielding IOU shareholders from all risks and responsibility regarding the procurement practices of the IOUs, passing the burden of IOU malfeasance onto Community Choice customers. The APD would force Community Choice customers to pay for IOU commitments that are: a) unpredictable and non-transparent; b) above market price; c) made after the Community Choice program is established; d) made through a non-competitive processes; and/or e) at prices hidden behind layers of IOU confidentiality requirements. 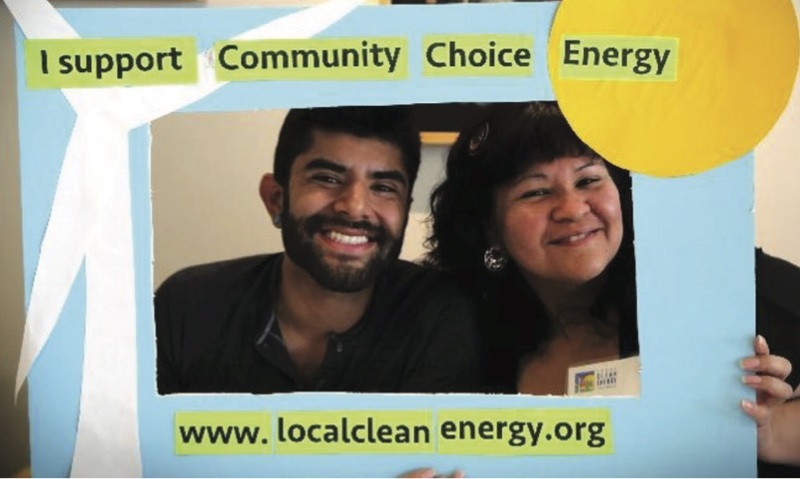 California has 18 operational Community Choice programs in 160 communities, serving eight million customers. These programs are leading the way to a future in which our State’s aggressive greenhouse gas reduction targets are not just met, but are met ahead of schedule, cost-effectively, and with economic and social benefits to their communities. To comply with the Legislature’s intent in AB 117, creation of the Community Choice option for local governments, the CPUC must ensure that avoidable, unfair, anti-competitive costs are not shifted to these programs. CPUC’s adoption of the APD would undermine Community Choice programs, in direct violation of the AB 117. This action would showcase yet again the CPUC’s bias toward the IOUs and against Community Choice programs. You can share the letter/ Action link with your friends, Facebook and Twitter followers. As is often the case, this is a campaign about numbers – the MORE constituents weighing in, the better. If you are a member of an organization, urge your organization to adopt the Action Network letter above and to get members of the organization to sign up individually. Damaging to all the clean energy progress made thus far, undermining the 100% renewable objectives just passed in SB 100, and NOT in the State’s best interest. “CalCCA Responds to Commission’s PCIA Proposal” – CalCCA Press Release August 3, 2018.